Visitors to the south west of Scotland in Dumfries and Galloway are often drawn to that region in their regard for the national poet Robert Bums; and also may be familiar with the old Scots songs of which none is more well-loved than that featuring "Bonnie Annie Laurie" who was born at Maxwelton House. That is an example of how a celebrated song sung down the years with such affection can become better known in these Maxwell clan lands than the Maxwells themselves and here we suggest a redress of the balance by telling the story of Sir John, the Master of Maxwell. He was born in the early years of the 16th century and educated at Sweetheart Abbey. To better set the scene of these times, it is first advisable to explain that the north of England - Northumbria, was by no means the most prosperous part of that country and envious eyes from the south looked at the lusher rich lands of the Scottish Border Country -conversely, Scotland must hold the Borders, if the kingdom was to be considered complete. Thus began the long history of raids and counter-raids and that which marked a dominance of any district the occupation of the castles. For example, the Castle of Lochmaben in the late 14th century, had been captured, lost and recaptured twelve times. And in 1545 when John Maxwell had grown to manhood and while his father and brother were prisoners in England, he held that same Castle of Lochmaben successfully against an English attack. Military might had a hand even in the preliminaries of his marriage in 1547 with Agnes Herries. The Earl of Arran. Governor of Scotland at the time, was Agnes Herries' guardian and he wished that Agnes should marry his own son Lord George Hamilton. It happened that Maxwell was employed then by the Earl of Lennox to negotiate with Lennox's father-in-law the Earl of Angus regarding the recovery of the Lennox estates in Scotland; and to persuade the Earl to do business, Maxwell commanded a forbidding body of 2000 horse; and took the opportunity of first confronting that other Earl - of Arran, suggesting that he Maxwell, since he had maintained his interest in marriage to the Herries girl, would find it difficult to restrain his horsemen should he be refused Agnes's hand. . . the Governor's reply was that Maxwell "should fall back with his cavalry" while discussion took place; and agreement having been reached, permission was given that Maxwell should have Agnes Herries as his bride; she was an heiress along with her two sisters of the third Lord Herries; and in time Maxwell became heir to the title as the fourth Lord Herries. Mary of Guise, wife of king James V and mother of the future Queen of Scots, became Queen Regent on the death of James and since she did (as would her daughter in time) uphold the Roman Catholic faith, Maxwell was imprisoned by her in the Castle of Edinburgh for declaring openly that he would - "to the uttermost of his power, assist the preachers and the congregation " - in other words, he would support the Reformed party of the Protestants, the principal preacher referred to, being John Knox. Such a distinguished prisoner was given more freedom within the Castle walls than might have been afforded to any of the criminal class and Maxwell having more to do than languish in prison, soon contrived his escape. Maxwell's chief claim to attention in his country's history however, is centred on his association and support of Mary, Queen of Scots. At five years old, Mary had been sent for safety to France where she was in the care of four of her uncles - all distinguished men in their religious and political affairs and she was given the benefits of a Royal upbringing with an appreciation of the Arts. When her boy husband Francois II king of France died when Mary was seventeen, and although sought after in marriage by crowned heads of Europe, she returned to Scotland on the advice of her guardians. John Knox's pessimistic outlook on such a return is well demonstrated in this short excerpt from his History of the Reformation. "The 19th day of August 1561 arrived Marv, Queen of Scotland, then widow, with two galleons out of France . . . the very face of the heaven at the time of her arrival, did manifestly speak what comfort was brought into this country with her - sorrow, color, darkness and all impiety; for in the memory of man that day of the year was never seen a more dolorous face than was at her arrival . . . That forewarning gave God unto us but alas the most part were blind. . . "
The first Sunday after her arrival there were Protestant riots in the streets of Edinburgh following her attending Mass; and in such a situation Maxwell found himself in a quandary - his belief in the Protestant cause against his avowed loyalty to the Queen. He had always been a good friend of John Knox, but this regard for Mary, cooled the relationship between the two men and he also had to display some diplomatic skill with the Queen when her half-brother Lord James Stewart whom she suspected had designs on the Scottish throne, rebelled at her marriage to Lord Darnley in 1565, seeing Darnley, Mary's Consort, as a rival for the Crown. Maxwell had now to persuade Mary against bringing charges of treason against her half-brother who fled from Edinburgh to the west where he was met by Maxwell; and coming south to the clan country around Dumfries was lodged in Maxwell's house. Then, on receiving instructions again to find Lord James and arrest him, Maxwell arranged the fugitive's escape into England. Darnley, in Scotland's turbulent history is seen ever more consistently as surely one of Scotland's less than acceptable characters. Before his own violent end awaiting him, he had suspected David Rizzio, the Queen's secretary as being the father of the child Mary was expecting, and arranged for the brutal murder of Rizzio in the Queen's presence. Mary's baby, which she swore was born from her marriage with Darnley, was delivered with general rejoicing in the Royal apartments in Edinburgh Castle - a son, destined in time, to be James VI of Scotland and 1st of England -the first monarch of both kingdoms, which happened when Mary's cousin Elizabeth the 1st of England - "The Virgin Queen", died. On to the stage of Scotland's history now steps the formidable Earl of Bothwell who, contemptuous of Darnley, schemed to marry Mary himself. His attentions found favour with Mary but she refused to consider divorce. There were other ways, it was hinted. . . The story persists that witnesses swore they had seen many barrels of gunpowder being delivered to Bothwell's house, then taken by pack horses to the lodging in the "Kirk o' Field" (its site on the present University of Edinburgh) where Darnley was convalescing after an illness. On a night in February 1567 Edinburgh's citizens were wakened by a rumbling explosive roar - and what has remained one of Scotland's most noted murder mysteries was revealed . . . the bodies of Darnley and his servant lying some distance from the lodg ing; and to ensure that this devastating manner of removing one who was considered very much in the way, Darnley had been strangled with his own garters! In the previous year Maxwell had been created Lord Herries and Herries had become the Queen's staunchest supporter - even although one of the Lords of Court commented that "Herries was the cunning and wisest of the whole faction; but, as the Queen says of him, there is nobody can be sure of him". His concern for the Queen's welfare however, seemed genuine enough, for Sir James Melville diplomat (a diplomat who earlier had acted for Mary in personal discussions with Elizabeth of England) noted in his Memoirs that when rumour reached Herries of the Queen's intention to marry Bothwell "he besought her on his knees to eschew such utter wreck and inconveniences as would be brought on". And Herries was proved right. The marriage brought about rebellion by the Scottish Lords - a condemnation severe enough to cause Bothwell to flee the country never to return, and Mary, a virtual prisoner, was escorted back to Edinburgh where apart from all else, it was said she had approved the murder of Darnley - an accusation without any proof but sufficient to set the Edinburgh mob demanding she should be burned - as witches still were. Knox in a thunderous sermon from the pulpit of St. Giles' demanded she renounce the Throne. This she was advised to do, and for her own safety taken prisoner to Loch Leven Castle north of the Firth of Forth. The Maxwell family history observes - "It was to Herries that Mary entrusted herself when her cause was lost" But from Herries' point of view her cause was not as yet lost, for he planned the successful means of her escape from Loch Leven. Joined by a group of nobles yet loyal to the Queen, with their armed followers ready for battle, they met a force led by the Earl of Moray (who had been the first Regent to be appointed to rule the Country until her son James would ascend the Throne) with Herries commanding the cavalry of Mary's supporters. The battle took place at Langside just south of Glasgow, with defeat for Mary, who lost around 300 men. She rode from the battlefield south accompanied by the faithful Herries and to refuge in the Maxwell territories. There, she decided, although Herries advised against it, to seek help from Queen Elizabeth. Her letter to the Queen of England included this passage: "I am now forced out of my kingdom and next to God, I have no hope but in your goodness. I beseech you therefore, my dearest sister, that I may be conducted to your presence, that I may acquaint you with all my affairs". Mary travelled west into Galloway and stayed at Dundrennan Abbey before, in the company of attendants including Lord Herries, finally leaving Scotland, crossing the Solway Firth the two places of departure and landing named to this day, Port Mary and Maryport. Herries tried on Mary's request to see Elizabeth and he journeyed south for that reason but was refused audience by the English Queen. Mary's subsequent tragic end by the executioners axe is another story. Herries, for his loyalty to the Queen suffered the devastation of much of his property, but himself survived to continue to serve his country. He died in Edinburgh in January 1583, survived by his wife Agnes Herries and their four sons and seven daughters. There are three places especially associated with the Maxwells of that time in Dumfries and Galloway, and in all three what remains of the stone fabric has been moulded by weather and the passing years to a beauty that can haunt the beholder. The red stone of the Abbey of the Sweetheart where young Maxwell as schooled. The grey of Dundrennan where nearby old houses have walls of a similar colour - too similar not to be anything other than stones from the Abbey itself, probably taken after part of the Abbey kirk had served as the parish kirk until 1742 when it was abandoned. The Abbey of Dundrennan was founded in 1142 and housed by monks of the Cistereian order. It was Edward Maxwell, the last Abbot of Dundrennan who sheltered Mary in the monastery during the last night she was to spend in Scotland. After the Reformation in Scotland was established, the General Justiciar of the district ordered Lord Herries to demolish the monastery, but this in the true Maxwell tradition of defiance of authority, he refused to do. So, to red Caerlaverock - although in partial ruin, probably one of the most splendid and loveliest of the more ancient castles left in Scotland - unique in its triangular shield shape, like the shape of the warrior shields at the time of its building, and, rare for Scotland in being moated from a nearby spring. One of the natural highways into Scotland in medieval times was by water - then, often more convenient than transport by such roads as there were in these days, and Caerlaverock was initially built to guard such a landing place - convenient to travellers friend or foe, crossing the Solway. It was completed in the year 1300. As would be expected in such a situation, the castle changed hands at intervals all according to the state of affairs between the two countries. 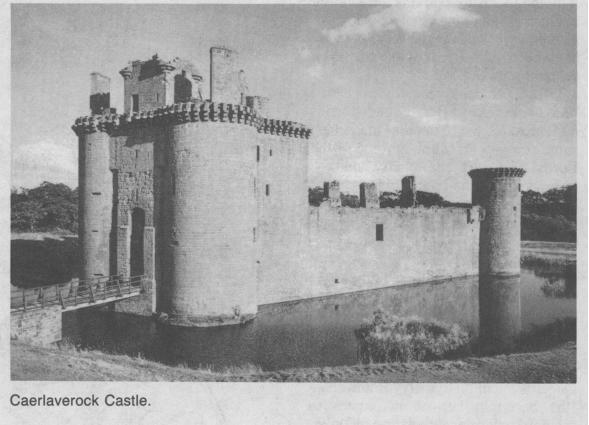 It received its initiation as a fortress in a siege by Edward I of England in that year of 1300 and throughout its history has suffered partial demolishment and rebuilding, although the north-west tower at the site of the drawbridge remains as does the wall leading to the south-west tower, the original medieval structure. Finally, the Maxwell associations with Caerlaverock. In the 15th century the last medieval additions to the Castle were made under the instructions of Robert, second Lord Maxwell. In 1593 repairs were once more in hand under the guiding hand of a Maxwell who was - "making great fortifications and has many men working". When James VI came to reign over both kingdoms an era of peace cast a calming spell over the war-town Borders. In the inner courtyard of Caerlaverock there is a date 1634 above one of the windows. Here was a rebuilding not for war, but for harmonious living; and we leave the Maxwells on such a peaceful note, where this last addition erected by Robert Maxwell the first Earl of Nithsdale, was referred to in 1640 as "that dainty fabric of his new lodging". Back to the "Family Castle" page.